1. Is Lucid Travel a travel agency? No, we simply connect you to existing online booking engines like Priceline, Booking.com and Hotel Planner. Everything is exactly the same but a percentage of every booking is given back to the team as a means of fundraising. 2. If teams get a percentage back on every booking, are prices higher than normal? No, prices are exactly the same as our partners. We literally show you exactly what's on their website. 3. How much money does our team make for each booking? Every travel partner agrees to different commission rates so your team's 'give back' rates will vary depending on the type of travel service (Hotel Rooms, Room Blocks, and Car Rentals) you book. Hotel Rooms (0-9 Rooms) 2-7% This varies based on what vendor you book through. Room Blocks (10+ Rooms) 0-10% Give back rate is subject to the agreement you negotiate with the hotel directly. Car Rentals 2-3% Lucid Travel honors 50% revenue share up to 6% total commission. Fligths $4 to $10 per ticket Lucid also has special promo deals for flights. *Revenue share = The percentage of our total commission that we give back to the team. 4. What is the average 'percentage back' for hotel rooms? According to our current sales, the average 'percentage back' for hotel rooms is 4.3%. 5. How do teams get paid? We are very flexible with payments. If your team has a tax-deductible account, Lucid Travel will pay through that. Otherwise, we typically write a check and mail it to what ever address you prefer. We can also pay with PayPal or Venmo. 6. Can teams take out their money raised at any time? Yes, but the intent of the fundraising model is to accrue a large sum of money over time. You can think about it like a passive way for your team to save money over the course of an entire season. You must raise at least $50 total to recieve a payout by Lucid Travel. 1. Can Lucid Travel set up room blocks at discounted prices? Yes, we're partnered with Hotel Planner which allows you to submit your group request online, in a couple of clicks. After submitting your request, simply sit back and wait for hotels to start populating discounted offers. Group rates can be as much as 60% off standard rates. 2. Can we share our team page with others? Yes, you can share your team page with anyone, anywhere. This is the primary way teams raise money. Using it for your team's travel is great, but the only way to make the big bucks is by sharing your page with others in your network. 3. How much does our team get when we invite another team? Your team will receive $10 after the team you invited makes thier first hotel booking. 4. How does our team get credit when we invite other teams? Send your team page to other teams using any medium you'd like (social media, text, email, etc). Any team that signs up from your team page (meaning they landed on your team page, then signed up) will be automatically tracked. Your team's unique ID will be tagged to their account so you will get credit automatically. Login to your team's account, then click "Invite Teams, Earn $" to see a list of all the teams that you invited. 5. What if we want free cancelation and no prepayment? Our main search box has very flexible cancelation policies. Look for the "Pay At Hotel" options and make sure to read over the cancelation policy information to find the best deal! 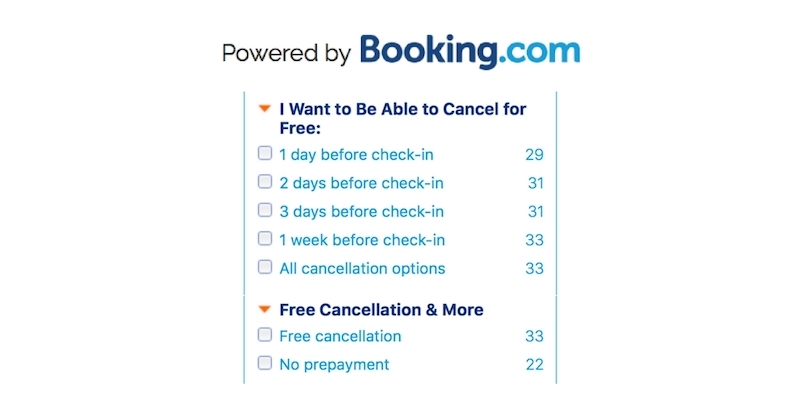 Alos, our partner Booking.com conviently has a filter options for Free Cancelation & No Prepayment! 6. What if we are tax exempt? Use our main search box (the one that consolidates all rates from the top sites) and book a room with that shows "Pay At Hotel". This means your card will not be charged until you arrive at the hotel. Once you arrive, show them your 501(c)(3) Form and they will deduct the tax off of the charges. 7. What if we only book rates that are directly from the hotel? Use our main search box (the one that consolidates all rates from the top sites) and book a room with that shows "Pay At Hotel". This means your card will not be charged until you arrive at the hotel and it comes directly from them. We can even make it so your search box only searches rates that are coming directly from the hotel (meaning no rates from 3rd party sites will be shown). Exclusive deals, free stuff and news from our users.